Steelhead fishing in sideways sleet presents both opportunity and challenge, but rarely in equal measure. Specifically designed to fit female anglers, our durable and high-performing River Salt Jacket provides the fishing-specific features and weather protection you need to keep the equation balanced in your favor. Made with extra-tough H2No® Performance Standard 4-layer, 6.1-oz 100% polyester solid twill microfiber with a waterproof/breathable barrier and a DWR (durable water repellent) finish, it has a waterproof, corrosion-resistant YKK® front zipper and watertight adjustable cuffs to seal out wind-driven precipitation. Two large, streamlined front zippered pockets hold fly boxes, close with TPU-coated water-repellent zips, and won’t snag flying line on the shoot; the single small upper-arm pocket stashes lip balm or other essentials. The elastic drawcord at the hem is encased in a mesh-lined casing that drains excess water, and when you have to crank up and run into the teeth of it, the innovative vented hood is fully adjustable and stays in place at speed. 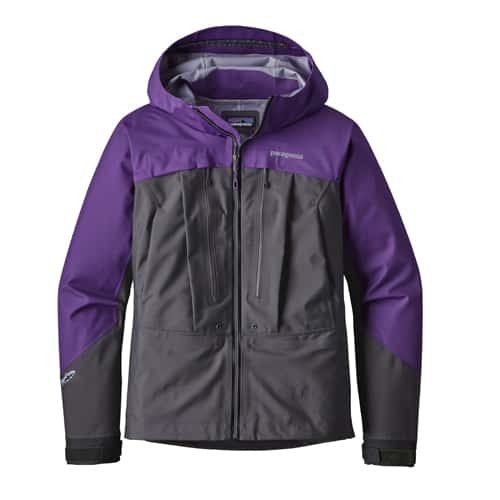 This Patagonia Women's River Salt Jacket is top-notched in every way, I can't tell you how excited I am to wear this jacket again on our next fly-fishing adventure.